At some point, unless you are an extremely light computer user, most people will outgrow their Time Machine disk and need to migrate to a bigger one. Here’s how to do it without losing your backup history. As a Time Machine disk drive gets full, the program will automatically delete your older backups to make room for new ones. Some folks won’t care depending on how long ago those backups were made, but others feel compelled to have a permanent snapshot of their systems from any given time always available. The only way to handle this particular situation is to get a larger hard drive to replace your current TM volume. Unfortunately, a new drive means starting fresh with a clean slate and no backup history. 1.) Connect both your current TM drive and the one you plan to use in the future to your Mac. 2.) Turn off Time Machine to avoid having new backups made during the cloning process. Make your way into System Preferences and slide the big switch into the Off position, as shown below. 3.) Launch Disk Utility (Applications > Utilities). In the left pane you should see both of your disks on the list. Click on one of them and select the Restore tab towards the top of the window. 4.) Drag your current Time Machine volume (shown with a green disk icon on the left pane) to the Source field. Then drag your new Time Machine volume to the Destination field. Ensure you have no important data on the Destination drive because it will be erased permanently. 5.) 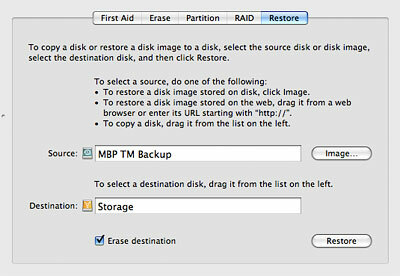 Check the “Erase destination” box and click the Restore button. Cloning the data block-by-block may take quite a bit of time, so expect a fairly long wait. 6.) Once the data has been copied, it’s usually a good idea to rename the old TM volume so it doesn’t conflict with the new one. Right-clicking on its name in Finder and choosing “Rename…” is all there is to that. 7.) Finally, go back into System Preferences and switch Time Machine’s slider back into the On position. Everything should pick up right where it left off, except with more room to breathe on that new disk drive. Why does this not work for me? My current backup is on a WD Essential 320G. Just bought the same external drive in 500G. – when I check the ‘erase destination’ checkbox, I immediately get a warning that the destination drive is in use, and the whole thing stops (new WD came straight out of the package). – When I dont check that option, the restore copying process starts. It estimates 15 hours! for the 300+Gigs. But about 1-2hours in, the process terminates with a warning that it cannot proceed. Thank you for the quick and helpful tip. This totally worked, my entire disk is now copied. Have to see still if it recognizes it as the ‘old’ backup, but think that should be okay. Yes, it works great! One thing: on my LaCie drive, I had to reformat (repartition) with Disk Utility first, in order for it to be available as a destination there. Thanks so much for posting this! Very cool. It took a while, even over FW800, but well worth it! This worked great for me. I copied the hard drive, pointed TM to the new drive then renamed the old hand drive. TM continued on like nothing had happened and I have all my old backups as well. Several weeks later I had to reboot the system and TM switched back to using the old drive (even with the “new” name). I switched it back manually and everything seems fine, but just for kicks I rebooted again and sure enough, it forgets which drive it was pointing to and switched back to the the old drive. Anyone have a idea how to solve this? The OS must be remembering the Universal Unique Identifier for the drive or something. Also, what is the “Owners Enabled” attribute? I see that both drives are set to YES. I’m backing up to an external USB drive, but I now get TM disk full, I thought TM deleted old back ups to make room. Can anyone help with this problem? I tried it two ways and it didn’t work: first, I tried it with the «Erase destination» boxed checked, as instructed. Then I got an error message saying there was «not enough space on /dev/disk1s2» for it to be restored. Then I tried without checking the «Erase destination» box, to see if it would change anything, and instead I got a message saying the restoration was impossible because the operation was not permitted. However, I can see some files on it after the second attempt. Can anyone help with that? Thanks! how can I transfer TM backup file from an old external HD to a new TimeCapsule? does this work for my problem?